About a month ago I reviewed Beringer's California Collection Cabernet Sauvignon (see the review here), which was slightly better than your average sub-$10 bottle of Cab. Beringer's California Collection is essentially one step up from their entry level wines and as such, costs a couple bucks more a bottle. They're still cheap wines (being under $10), but a little bit better than the regular versions. 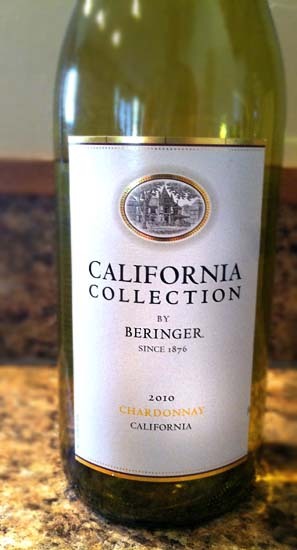 This wine is the 2010 Beringer California Collection Chardonnay produced out of the Napa Valley. It pours a pale golden/green color and smells of dried apricots, apples, and pineapple. Tasting brings dried green apples, dried banana chips, and finishes with some citrus. There are no oaky or buttery notes going on, nor are the tropical flavors really standing-out. Even though there are some potentially tasty things going on here, it's all a bit too subdued. I've definitely had some over-oaked Beringer Chardonnays in the past which they seem to have tried to correct when making this, but have unfortunately gone to the opposite side of the spectrum. I would definitely prefer if this chardonnay just had a bit more character and wasn't so... neutral. Don't Drink This: if you can find any of Beringer's other chardonnays. They certainly make some good ones, but this bottle just doesn't live up to what they're capable of. Hopefully the 2011 Vintage is better.